Jersey came back from 12-0 behind to end Bedford's seven-match winning run. Scores from Paul Tupai and Tom Griffiths put the hosts in control, but two yellow cards reduced them to 13 men. Tom Howe and Sami Fisilau tries gave the islanders the lead but Bedford were back in front by a single point with 10 minutes to go. Brendan Cope's penalty edged Jersey ahead again before Rich Lane ran through to seal a nail-biting win. The Blues had not tasted defeat in more than two months, since a 52-8 defeat by Bristol on 11 December. Bedford took an early lead when lock Tupai crashed over from close range and the score remained 5-0 for most of the half until Griffiths capitalised on a loose ball for a converted try. They ended the half with 13 men, however, with Justin Blanchet penalised at the breakdown and Tupai sin-binned as a maul crashed to ground. Three minutes after the restart Jersey made their numerical advantage count as Howe's try got them on the board, and then Fisilau's score put his side ahead for the first time on the hour mark. Bedford were not about to let their unbeaten run go without a fight, and Myles Dorian's penalty gave them a narrow advantage, having earlier struck a successful drop-goal. 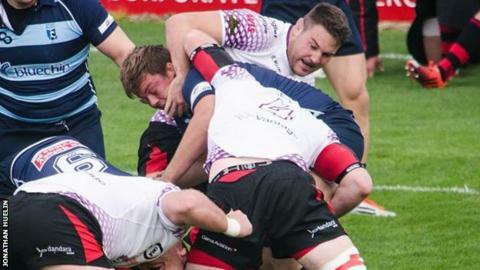 The Blues were to finish with 14 men though as Blanchet was shown a second yellow, for going in late on an opponent, and soon after Cope dispatched a penalty, won at the scrum, to put Jersey 20-18 ahead. There was still time for the home side to push for a winning score, but an interception saw winger Lane burst through to complete the win with the final play of the game. The teams will meet again at Goldington Road next month in the British & Irish Cup quarter-finals.